Eddie Aikau was a big-hearted man with a strong love for the ocean and for saving helpless people from monstrous waves. He saved hundreds of people in his lifetime working as a life guard at Waimea Bay, one of the most dangerous beaches on the island. He also gave his life, seeking help for his crew. 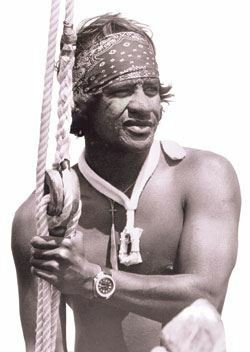 On May 4, 1946, Eddie Aikau was born, the third of six children: Frederick, Myra, Edward, Gerald, Solomon III and Clyde. Eddie's parents, Henrietta and "Pops" would take the kids surfing almost every weekend. This early exposure led to a life-long love for surfing. Eddie grew up in Lahaina and attended St. Anthony School. He lived by a Chinese graveyard, which his family took care of. They weren't the wealthiest family, but generously gave what they had. They would have parties at the graveyard now and then and would share their home with anyone who needed one. Eddie AikauHonolulu Magazine [Public domain]Later, Eddie and his family moved to Oahu because his father was offered a better job there working at the dock. Eddie soon became a Waikiki surf bum, surfing every day after school, before school, and even during school when there were good waves. This was the time when surfing really started to generate through the islands. Also, this was the time the north shore was really discovered. Eddie soon started to work and then dropped out of school. He then dedicated his life to surfing. Eddie eventually discovered Waimea bay, a sacred place where nobody dared to surf, because they believed there was some sort of Hawaiian curse on it. Eddie was with the first group to surf at Waimea Bay and was one of the bravest surfers out there. Eddie soon acquired a passion for saving people, after rescuing some tourists from the shore break. He had no high school education, but still got the job as the first Waimea bay lifeguard. He was the only one willing to go out in those waves to rescue people. Eddie was a very humble man and didn't care about rewards and thank yous. He said once that he just couldn't watch helpless people be taken by the sea. He never let anyone go. There was always a fight. That's just who he was. No matter how dangerous, "Eddie would go." 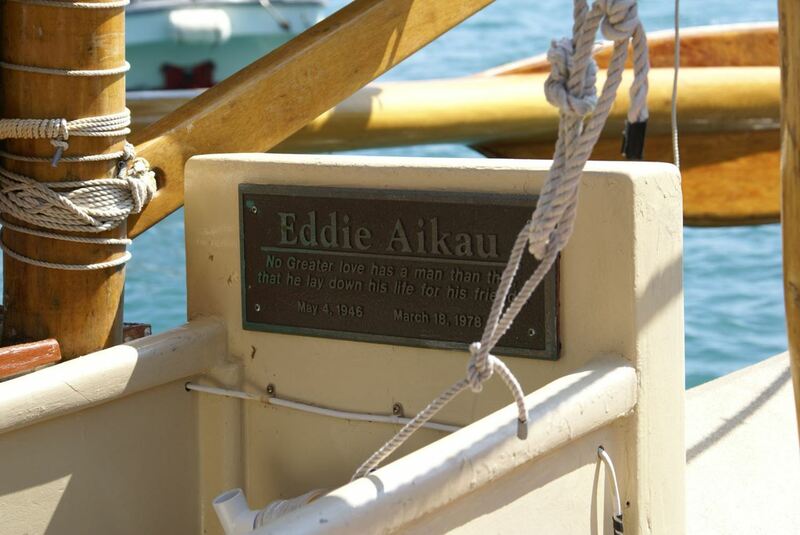 Memorial Plate of Eddie Aikau on Hokule'aWaka moana [CC BY-SA 4.0 (https://creativecommons.org/licenses/by-sa/4.0)]Later, he later joined the Hôkûle`a crew in a boat built by the Polynesian Voyaging Society, to reenact the journey of the discovery of the Hawaiian Islands. In this trip they would only use Polynesian tools to navigate, which included stars, wind, the sun, the moon, and the tide. After several hours into their journey they ran into some really bad weather outside of Lanai, and their boat capsized. While the crew was clinging on to the sides of the canoe, Eddie decided to get on his surf board and seek help. Lanai was only about 12 miles away, but they were outside of the shipping and air lanes and away from rescue. The next day the crew was rescued, but Eddie was never seen again. Eddie gives me a lot of inspiration to do things without expecting anything in return. He also is important to me because he had a tremendous heart for people he didn't even know. That is the true Hawaiian spirit, the Spirit of Aloha. The importance of Eddie to me also has to do with our common likes and dislikes. He had a special passion for the ocean and surfing, but no matter what he was doing in the ocean, if it was surfing, diving, or floating, he just liked being surrounded by it and taking up all its power and life. I love the ocean too, and share a similar passion for surfing. Eddie has inspired me to be more humble and generous, because the feeling of giving is twice the feeling of receiving. Eddie just blows me away with how much he cared for the people around him, that he would start paddling into darkness for a chance to get help. He could have just stayed there, but he would never forgive himself if they didn't get rescued and he didn't do anything to help. Eddie was an amazing person and will be forever remembered. The Eddie Aikau Foundation - is a charitable organization created to share Eddie Aikau's life, contributions and accomplishments while promoting education and the advancement of Hawaiian culture. The Hôkûle`a: - "Hôkûle`a Revives an Ancient Tradition"